alaTest has collected and analyzed 68 reviews of Black & Decker DCM18S Brew 'n Go Personal Coffeemaker with Travel Mug. The average rating for this product is 3.7/5, compared to an average rating of 4.2/5 for other products in the same category for all reviews. People are impressed by the reliability and design. The size and price are also mentioned favorably. Many are negative about the capacity and durability. We analyzed user and expert ratings, product age and more factors. 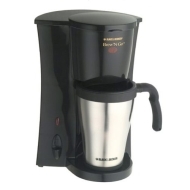 Compared to other products in the same category the Black & Decker DCM18S Brew 'n Go Personal Coffeemaker with Travel Mug is awarded an overall alaScore™ of 79/100 = Good quality. Bought from another source to replace an earlier model of the same product that finally failed after years of service. This model is higher and will hold larger cups. i really enjoy having a coffeemaker at home, but now i wish that it is bigger, at least good for three cups. The Cup is not insulated so it will cool fast, but it is not too big that you can't drink it before then. Over all I am satisfied at only spending ~$20 for this thing, it has lasted me, maybe it will last for you. my favorite coffee pot for one! Wouldn't this make a great gift for a student, or a commuter? The machine brews right into the thermal travel mug and then shuts itself off, so your favorite coffee lover can simply grab and go!